Sabretooth's new Jim Lee-designed costume debuts this issue, and thanks to its use in the animated series, it's become his default look for an entire generation of fans (he'll stick with it for a few years, before a series of attempts to keep him around the X-Men more replace it with some other looks). For the most part, I like it (and I like the idea of Sabretooth being more of a hulking bruiser, as Lee also bulks him up quite a bit, relative to the more lithe and smaller Wolverine), though it helps that it was the costume he wore when I first encountered him, and I certainly don't dislike his old look either. 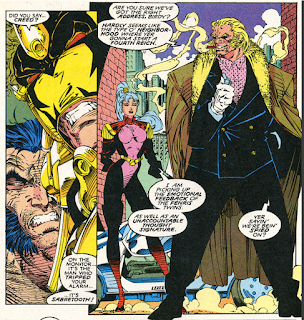 This issue also establishes a shared history between Sabretooth and Gambit, something that will cause quite a bit of fan fervor and speculation in the years ahead (a past meeting between the two will eventually be detailed in issue #33, and after that, it'll be established that Gambit helped assemble the Marauders prior to the Morlock Massacre) but for now is simply intended to add to the history and mystique surrounding Gambit. 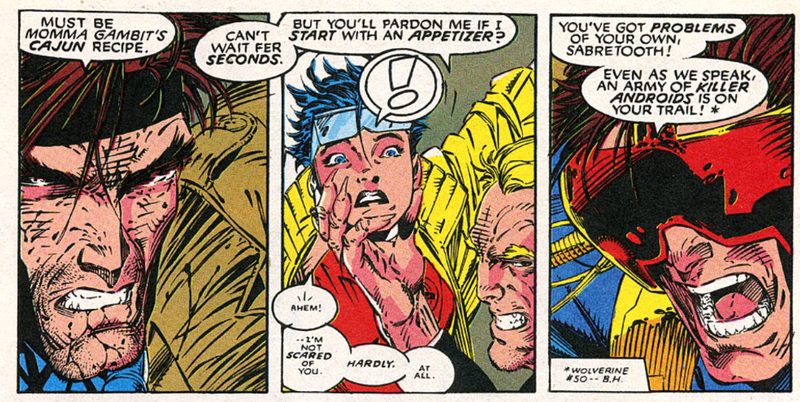 Sabretooth's dialogue here also hints at one of Claremont's initial ideas for Gambit, that he was planning on betraying the team from within. 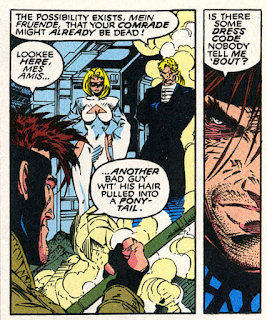 Sabretooth also refers to Gambit as "Remy", the first time his real first name has been used. Picking up where the Longshot/Dazzler/Lila Cheney appearance last issue left off, Mojo appears briefly in this issue, before the trio escapes and meets back up with the rebels opposing Mojo, at which point Longshot & Dazzler reconnect, setting up the story which will unfold in issues #10-11. More background on Maverick: his real name is David North (though I think that might get retconned out) and he's working for someone he only refers to as "Major" to acquire the carbonadium synthesizer (the same thing the bad guys are after and which Team X acquired back in the 60s). This issue also establishes his kinetic absorption mutant power. Sabretooth's associate Birdy appears for the first time this issue. Here, she's presented simply as a sort of Gal Friday with some telepathic powers; later stories will establish that she routinely provides Sabretooth with a telepathic "glow" that calms his more baser urges. She'll appear a few times in the years ahead, before she's killed off as part of the larger storyline that culminates in Sabretooth becoming a prisoner of the X-Men. Cyclops mentions a pack of killer robots hunting down Sabretooth, a reference to the end of the "Shiva Scenario" in Wolverine #50, in which Shiva gave up on Wolverine and moved down its list of targets to Sabretooth. As with this month's issue of Uncanny, Scott Lobdell replaces John Byrne as scripter, though his initial tenure on this title will be more of a fill-in, as he'll shortly give way to new ongoing writer Fabian Nicieza. A footnote explains that this story takes place after the events of "The Crunch Conundrum" over in Wolverine. Omega Red is said to be the Soviet union's first attempt at creating their own super-soldier, a la Captain America. 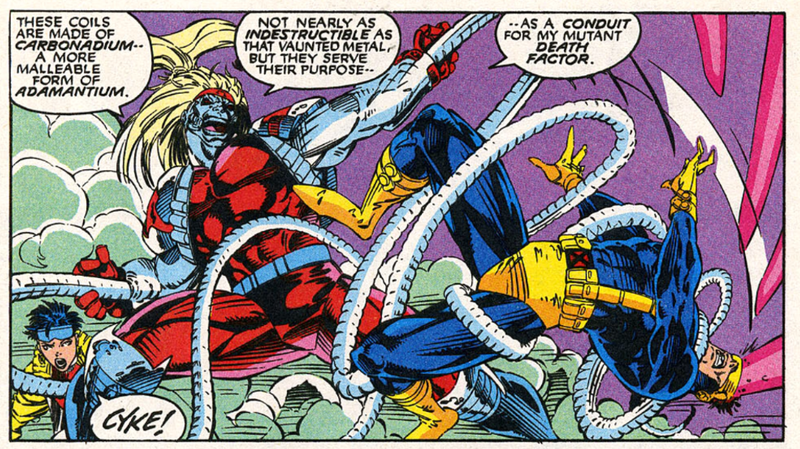 Carbonadium is described as being akin to adamantium, less strong but more malleable, and Omega Red is able to use his coils to focus his "death factor" power. 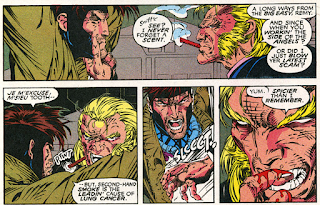 Maverick mentions the healing cells Wolverine stole last issue, a retroactive attempt to explain the silver canister Wolverine was suddenly carting around (and which disappeared just as suddenly when Jim Lee decided to stop drawing it). Presumably the idea is that Dr. Cornelius extracted some of Wolverine's healing cells for some reason, and Wolverine proceeded to steal them back. The psychic bond between Psylocke and Wolverine, established during the events of the "Lady Mandarin" story in Uncanny #256-258, is referenced here. 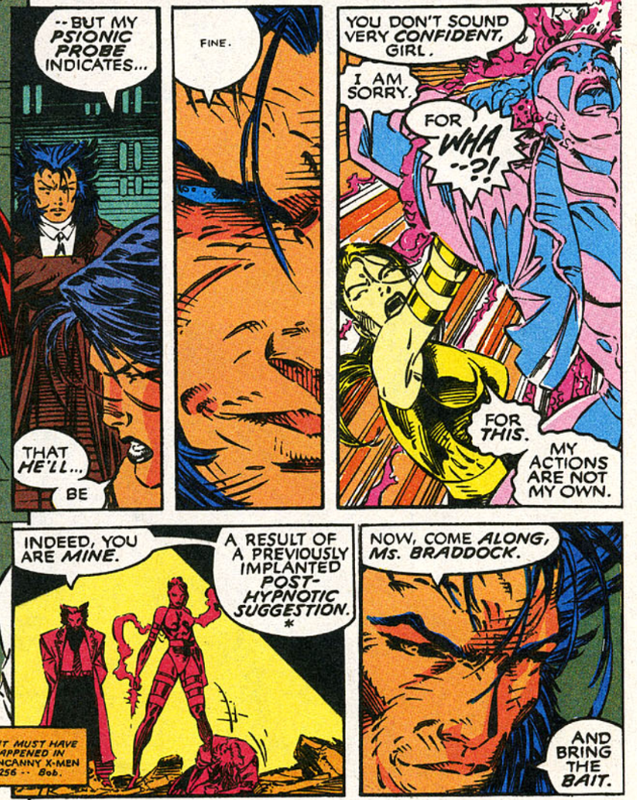 In another reference to that story, it's revealed here that Matsu'o established a post-hypnotic suggestion that enables him to regain control of Psylocke here. 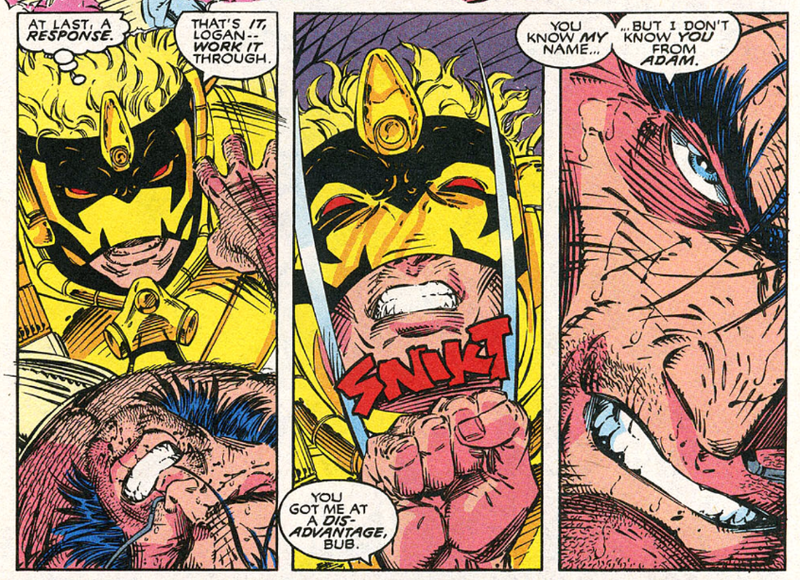 As with Wolverine, Sabretooth remembers neither Maverick nor their previous encounter with Omega Red back in the 60s. Omega Red makes a reference to depending on the kindness of strangers, an apparent nod at the Tennessee Williams play A Streetcar Named Desire, an odd reference for a Soviet solider who's been on ice since World War II to be making. Gambit wonders if all bad guys are required to have pony tails. Wolverine gives Maverick the old "don't make me pop the third claw" routine. It's also established that when Wolverine, Sabretooth and Maverick were all working together as Team X (still not called that in the text), they were CIA agents at the time. 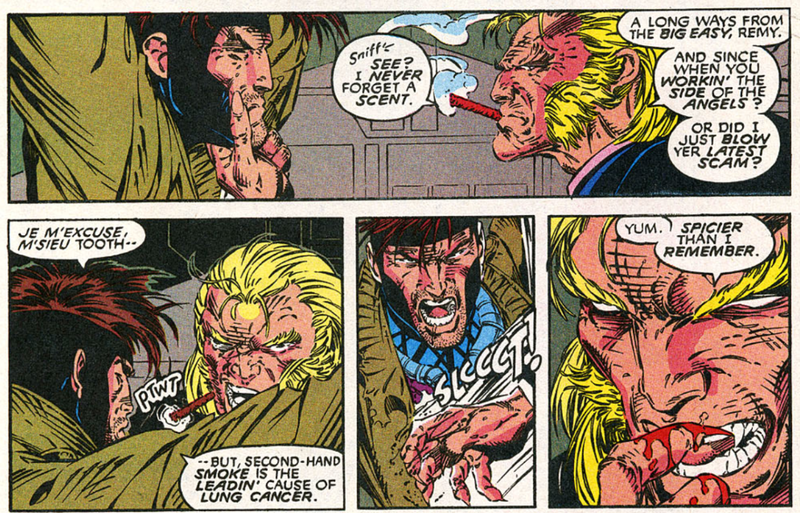 They also weren't aware they were all mutants, though Sabretooth suspected as much (it's not even clear if, at the time, Wolverine knew he himself was a mutant). A response to a letter in this issue wrongly confirms the Magneto/Moira retcon from issue #2, saying that Moira's alteration of Magneto's genetics is responsible for his Claremont-era reformation, despite the fact that issue #3 clearly establishes that not to be the case, both via Moira's dialogue declaring that the process wore off almost immediately after Magento started using his power, and from the fact that the same process, when applied to the Blue Team, began to wear off almost immediately after they started using their powers. But, this is probably one of the reasons why we still see that "Magneto's heroism was manipulated by Moira" bit sneak into reference material on occasion, despite the text itself clearly refuting it. "The problem was the books were terminally late when I was asked to script them. Jim [Lee] and Whilce Portacio would both send me the plot and then they'd send me three pages of pencils. I'd script those because they had to be scripted right away and fax the scripts directly to Tom Orzechowski, who was lettering the book. I bought my first fax machine working with those guys. Then I'd get one more and the one page didn't match the first three pages because they'd taken off on a tangent, and they were both doing this. So I was constantly re-writing, and re-writing and writing. It was just a nightmare. I was working weekends, which I never used to do in those days. I finally called Bob Haras and said, 'Something's gotta be done about this. This is insane.' And Bob said, 'We'll take care of it.' Years later I was told, you should always be careful when Bob says, 'We'll take care of it.' What ultimately happened was about two weeks later, Terry Austin called me and said, ''Hey, I hear Scott Lobdell is writing X-Men,' and I said, 'Huh?' And he said, 'Yeah, at a barbecue at Berni Wrightson's place, some friend of Scott's was there and said he's just picked up the X-Men assignment.' That's how I found out I wasn't writing X-Men, that's how they'd taken care of it." 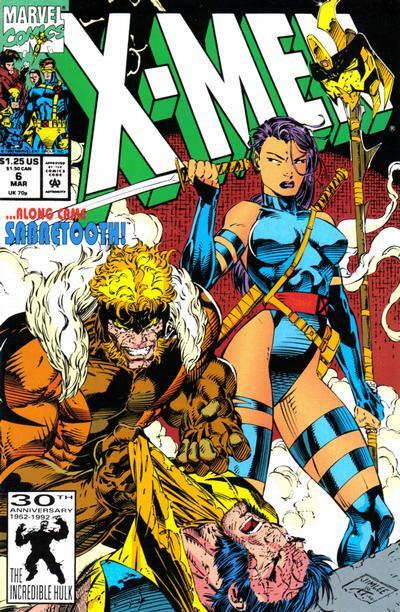 This issue is steeped in X-Men history: from references to contemporaneous Wolverine stories (the simultaneously-unfolding "Crunch Conundrum" and the recently-completed "Shiva Scenario") and Psylocke's transformation at the hands of Matus'o, to acknowledgements of shared pasts between characters, both new (Gambit & Sabretooth, Maverick and Wolverine & Sabretooth) and long-established (Wolverine & Sabretooth). Reading this for the first time, it's easy to get swallowed up by the concept of an ongoing narrative that stretches back an untold number of issues, to realize this issue is but one chapter in a massive ongoing saga. Some critics, then and now, would argue this makes it impenetrable to new readers, a game-ending turn-off, but when pre-teen me read this for the first time in the early 90s, it had the exact opposite effect: it sucked me in, cemented my growing affection for these characters, convincing me this was a narrative I wanted to explore specifically because it was clearly so steeped in history - that just meant more comics to read. 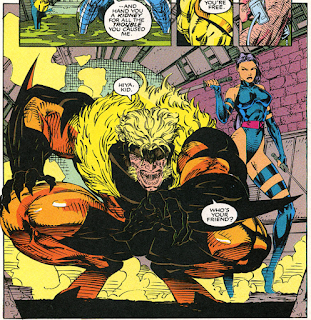 Of course, it would be years before I realized that some of this - like the Gambit/Sabretooth interactions and everything involving Maverick - was as much a mystery to fans who had read every issue as it was to me (and even longer before I realized this was the first appearance of Sabretooth's Gal Friday Birdie, whom I had just assumed was someone he was always paired with, or that Sabretooth's history with the X-Men as a whole was more limited than this issue suggested), but that didn't change the fact that the glimpse into a larger world this issue provided got me hooked. 90s comics get a lot of flak for being impenetrable and convoluted, sometimes rightly so, but when done well, that same level of complexity can be a feature, not a bug. This issue does it right, at least as far as twelve-year-old me was concerned. Tomorrow, the anti-Phoenix is unleashed in Excalibur #48. Friday, Wolverine travels to the end of time in Wolverine #52. Next week, the conclusion to "War and Pieces" in Incredible Hulk #392. I was never sure about Sabretooth's redesign. He always seemed a bit too "covered"--wearing gloves over his claws doesn't really make any sense, and the weird head-fabric design seemed like it was starting to get cliche by this point. I can't help but prefer his original look. Re-reading this in Mutant Genesis 2.0, I only just then realized that his costume seemed almost intentionally based on Wolverine's brown one. Which maybe makes some sense, but is a little odd now that Wolverine's changed to his yellow/blue one. If Wolverine is trying to evoke a more bright, superhero-esque image, it makes some sense that Sabretooth would embrace a darker, more animalistic look of the kind Wolverine is trying to distance himself from. Its funny birdie got killed off a year later in sabretooth limited series in 93 and then for some reason, she was added in with one of sabreooth moves for the Capcom fighting games starting with X-MEN vs Street Fighter in 96, 3 years after she got killed off. I assume she's more popular of the game just like omega red and sabretooth design used in the animated series and capcom games. yea one of sabretooth moves int he capcom games has him calling Birdie and she would shoot as the opponent with a machine gun. did she do that in any of her few appearances in comic book history? Yes, she carried a huge gun in the Sabretooth mini. Bob Harras, the man who got Claremont AND Byrne kicked out from two X-Men books. It's kind of funny when you put it that way. Especially given the animosity between Claremont & Byrne. What every misses about the issue when Magneto was de-aged, so was everyone he was with, so Blob, Mastermind, etc. It never has been covered what happened to them and how they grew up to be the exact same people when given their lives to do over. Wasn't Moira supposed to have accelerated his again too, so who took the other babies and did they have their age accelerated and did she raise them all? If she raised them, wouldn't you try to curb those crazy tendencies and also brings back the idea of if you could kill Hitler as a child, would you? As Jason said, Moira had nothing to do with Magneto (or the rest of the Brotherhood's) re-aging. The idea is, infant Magneto is entrusted to her care and she tinkers with his genetics in the hopes of preventing him turning evil when he grows up (naturally) a second time. Then Erik the Red restores him to adulthood, and whatever changes Moira made get wiped out almost immediately after he starts using his powers, so the whole thing is a wash. Except to Magneto, who (more or less rightly) feels tampered with, even if the tampering failed. I believe this is the first time we actually see the real Sabretooth besides the Wolverine flashback in #10. The rest have all been retconned to be clones by Sinister and that he was always this big and much stronger than Wolverine and not like the clones that would get beaten by Rogue or Wolverine in the past. Has that officially been retconned in? I know the notion of Sinister cloning the Marauders is canon, and that Claremont intended to establish that most appearances of Sabretooth were clones, but he never did, and as far as I know, no one ever officially made that idea canon. I think the biggest thing that stood out to me is that Tom Orz is still lettering this book. When I see the exclamation mark over Jubilee's head and those small font text for her muttering under her breath in fear and mock courage, it still FEELS like X-Men even though Claremont is gone. That feel, along with Jim Lee's art and the propulsion and history powering this story, keeps me engaged even with the original author out of place. 100%. Once Orz taps out, it really feels like the end of the classic, 'true' X-Men. I had no idea this was Birdie's first appearance. Since there was no explanation to her introduction I assumed she had appeared in a Hama issues of Wolverine. That kind of blows my mind. I agree with Jeremy about Lee and Orz still making this seem like a continuation of Claremont's X-Men. Plus, it's not like Claremont himself wasn't fascinated with revealing previously unknown back stories for a lot of the characters. Plus I like that they're actually bothering to wrap up stuff like Dazzler's Siege plot. I always assumed Birdie came from somewhere else, too. Since she never got a trading card and WIZARD never made a big deal out of it, it took me way too long to realize this was her first appearance. "A footnote explains that this story takes place after the events of "The Crunch Conundrum" over in Wolverine." And that's possible for the Longshot storyline. 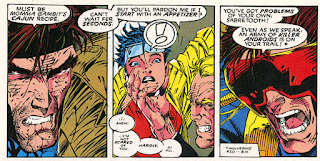 However, the Crunch Conundrum ends with Jubilee in Japan, and the next Wolverine storyline involves Matsuo seeking revenge on Wolvie for cutting off his hand in this story, so the Omega Red plot has to take place before the Crunch Conundrum. "Omega Red makes a reference to depending on the kindness of strangers, an apparent nod at the Tennessee Williams play A Streetcar Named Desire, an odd reference for a Soviet solider who's been on ice since World War II to be making." Omega Red's defeat at the hands of Wolverine and Sabretooth is clearly meant to take place after the building of the Berlin Wall started- so 1961 or later. A Streetcar Named Desire was first performed in 1947. 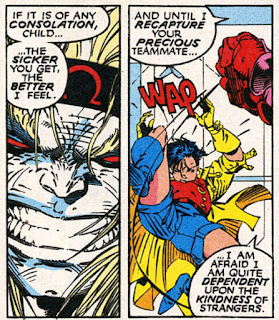 So there's plenty of time for Omega Red to have heard the line. It's still a little odd for a Russian to quote Tennesse Williams but hey, General Zhukov liked Coca Cola. I think I misinterpreted Omega Red as being a product of WWII, iced, then thawed for this '61 appearance. But that's not really the case, making the STREETCAR reference slightly less egregious (I still think it's a bit of a stretch). And yeah, I think the chronology goes "Omega Red", "Crunch", then the Mojo stuff in this issue. Did we know Lila could teleport across dimensions as well as vast reaches of space? I'm not sure if it's her doing that, or her trying to do a normal teleport then getting nabbed by Mojo in the process. "he'll stick with it for a few years, before a series of attempts to keep him around the X-Men more replace it with some other looks"
If anything, Sabretooth's look since 2000 or so has been more in line with the movie version than anything else. "As with this month's issue of Uncanny, Scott Lobdell replaces John Byrne as scripter"
Lobdell's work here is a bit...clunky. I guess it was all last minute. "In another reference to that story, it's revealed here that Matsu'o established a post-hypnotic suggestion that enables him to regain control of Psylocke here." A nice use of continuity, I have to say. 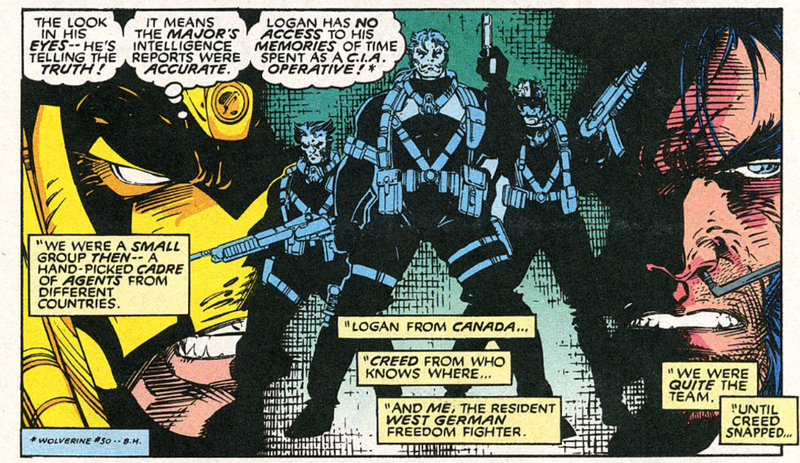 "It's also established that when Wolverine, Sabretooth and Maverick were all working together as Team X (still not called that in the text), they were CIA agents at the time"
Good to know the CIA in the past approved of big guns and pouches! pouches! pouches! back in the day. You'd think, though, they'd have been outfitted to look a little more discreet. I believe this is the first time we actually see the real "Sabretooth besides the Wolverine flashback in #10. The rest have all been retconned to be clones by Sinister and that he was always this big and much stronger than Wolverine and not like the clones that would get beaten by Rogue or Wolverine in the past." Was it retconned? I always assumed it was the same Sabretooth that we had since with the Marauders, and the same one we've been seeing recently in New Mutants, X-factor, etc. I know CC wanted the Marauders Sabretooth to be a clone, but I don't think it was ever established by anyone (unless it was retconned much much later and I missed it). Of course, Birdy doesn't fit in otherwise, but whatever. Overall, it's a decent story, though a bit clunky at times and a bit too many ingredients in the pot. While not as good as Excaliber or X-factor, it is certainly better that what Uncanny and X-force were giving us, and is somewhat enjoyable. "This issue does it right, at least as far as twelve-year-old me was concerned"
I'll speak to that more in next issue's post, but I'm still mostly enjoying it, some quibbles aside. This is my favorite costume for Sabretooth, by far. I've never really liked his original outfit. 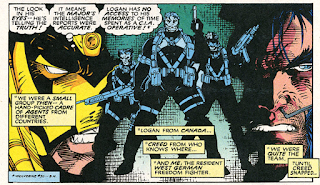 Also on the costume front, I've always appreciated that when Lee draws the captive Cyclops with his straps and pouches all removed, he is essentially wearing the old Cockrum/Byrne outfit. He even apparently wears a plain red belt under the yellow utility belt! Interesting story about how Byrne left the book. I always thought he quit; didn't realize he was "let go". I think Bob Harras did that to a few people over the years. I seem to recall John Romita, Jr. said that his second run ended when Marvel simply stopped sending him plots to draw with no call (though Romita blamed the assistant editor in that case, but it seemed to be the standard procedure for Harras's X-office in general). I know I've read somewhere Romita Jr. saying that he learned he was no longer the regular UNCANNY artist when he heard Joe Madueira described as such, or something like that. This is absolutely nuts. I've been reading X-Men comics for almost 25 years and I thought I knew everything about them. But this is the first time I've ever heard of Birdy. I've never seen her before, and I probably don't own any issues she was in. How could someone related to such a major X-villain have eluded me for so long? In all honesty, can anyone explain how Bob Harras managed to get hired at DC, then promoted to Editor-In-Chief, when his only claim to fame seems to be firing Louise Simonson, Chris Claremont and John Byrne, then driving Marvel into bankruptcy? And Harras did not drive Marvel into bankruptcy. He was guilty of many other things, but I see people make this particular claim all the time and it drives me nuts. Tom DeFalco was editor-in-chief when Marvel was spiraling down that path, and he's said many times that blame for the bankruptcy can be laid squarely at the feet of corporate raider Ron Perelman, who owned the company during that period. Harras became EiC before the bankruptcy filing, true, but the groundwork had been long since laid by then. And in fact I would argue that perhaps the X-books actually helped keep Marvel afloat financially a bit longer than they might have otherwise lasted thanks to their sales. And, for all the creatives who seem to have issues with him, Harras, by many accounts, was liked by his editors. I know Tom Brevoort, Bobbie Chase, Jason Liebig, Mike Marts, and others have all said complimentary things about him over the years. I've come to believe that he was just not good at dealing with freelancers for whatever reason. And let's not forget that Chris Claremont eventually returned to Marvel to work directly for Harras around 1998 as the company's creative director, too. But to answer your question of how he got hired at DC -- I suspect his role there is very different from what it was at Marvel. It's pretty clear Geoff Johns and Dan DiDio are the the driving creative forces at DC. Harras was probably hired simply to coordinate things and ensure the trains run on time, which is something he generally did pretty well as both an editor and an editor-in-chief. He had twenty-five years or so of editorial experience, after all, having started at Marvel as an assistant editor during the Jim Shooter era. I doubt he's very heavily involved in the creative side these days. All that said, I certainly see why people have issues with the guy, and I'm not sure I'd ever want to work for him -- I just like to keep the criticisms balanced. From my perspective, he was pretty crummy in dealing with longtime creators, but at the same time I was in love with his editorial output throughout the entire decade of the nineties, both as X-group editor and as editor-in-chief. But, that said, I also think he had some major creative missteps during his time at Marvel, such as the Spider-Man relaunch and the X-books' "Revolution" and "Counter-X" stuff -- however even those are balanced out for me by the superb "Heroes Return" books from roughly the same time.